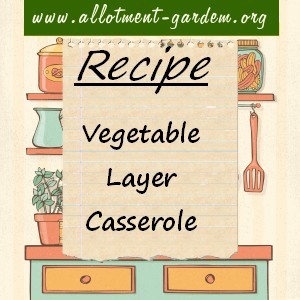 A tasty recipe using your home grown vegetables. Grease a 2 pint (1200ml) casserole dish. Lightly sauté the onion and crushed garlic in a pan. Place a layer of potatoes, onion, carrots, mushrooms, beans and grated cheese in the dish. Repeat until all the ingredients are used, finishing with a layer of cheese. Pour over the ingredients in the dish. Garnish with the sliced tomatoes and return to the oven for a further ½ hour.